Chico Distance & Online Education offers fully-accredited online courses and degree programs, providing students who do not live in Chico access to a CSU, Chico degree without having to come to campus. While the courses are entirely Web-based, many of the courses also provide live, synchronous video streaming of course lectures. To participate in these classes you will need to be admitted to the University and have a computer and access to the Internet. Students may combine Chico Distance & Online Education, Special Session, Summer Session, Winter Session, and on-campus attendance to meet the degree requirements of these programs. The current schedule of online courses may be seen here. California State University, Chico, established in 1887, is internationally recognized as a pioneer in distance education. 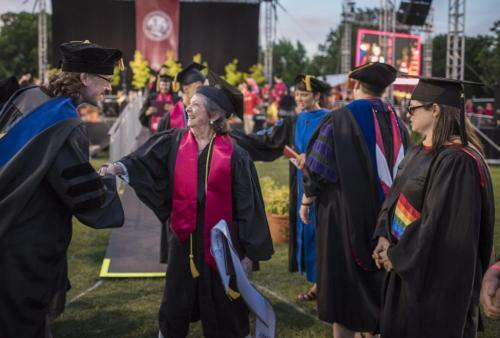 In its yearly ranking of "America's Best Colleges," U. S. News and World Report ranks Chico fifth among master's-level public universities in the Western United States. CSU, Chico offers more than 100 undergraduate majors and options and maintains one of the highest graduation rates in the California State University system. It is the second-oldest university in the 23-campus system. If you are ready to apply for one of these programs please visit the Admission/Registration page for complete details. The major in Social Science is 45 units designed to offer students a broad background so they can develop a sensitivity to how individuals relate with one another within society. Thirty-six (36) units are offered via Chico Distance & Online Education, with the remainder available at a community college. Upper division general studies thematic courses are available via Chico Distance & Online Education. The Social Science-Specialization Studies Option is a 45-unit major which consists of 24 units from one of the primary advising concentrations and 15 units in a secondary concentration, plus an integrated capstone social science seminar and an introductory computer course. The primary and secondary concentrations available to online students are Sociology and Career and Life Planning. All of the coursework is offered via Chico Distance & Online Education, with only one required course in the major that will need to be taken at a community college or other college, SOCI 100. If desired, 6 community college units can be used toward the major - 3 in sociology and 3 in life planning. The Liberal Studies Online Pattern is a degree completion program for students who plan on teaching elementary school or who desire a broad-based degree. Upon completion of our program you will have a Bachelor of Arts. Sixty (60) upper division units are offered. Students may take a portion of their lower-division work at a community college, at a CSU campus or online program, or at another accredited four-year college or university. If you plan on teaching, after earning your BA in Liberal Studie you will need to enter a credential program before you are ready to teach. At this time CSU, Chico does not offer an online credential program. The CSU, Chico online bachelor’s degree in Religious Studies is one of only four such programs in the United States. Religious Studies is the academic study of what religion is and how it shapes – and is shaped – by other cultural forces. The degree offers both deep knowledge of major religious traditions and comprehensive exploration of the role of religion in the contemporary world. Students enter the program with 60 to 70 transferrable units, including all lower division general education. The major consists of 34 required units for the major, 9 upper-division general education requirement units, and 17 elective units. Do you have a passion for studying social groups? Do you have a vision for a just society? The CSU, Chico BA in Sociology online degree completion program combines the theoretical and research traditions of sociology with hands-on practice, preparing you for a successful and rewarding career in sociology-related fields. The CSU, Chico School of Nursing is a leader in online education for nurses. The online program is evaluated by the same accrediting bodies that review our classroom programs. Students give our online programs high marks. Because of our rural service area many nurses could not continue their education without the online option. The School of Nursing has won numerous awards for its programs. Training for national certification by the National Career Development Association is provided through nine units of coursework provided online by CSU, Chico. Professional career and life counselors work in a variety of career development settings, such as career group facilitator, job search trainer, career resource center coordinator, career development case manager, intake interviewer, occupational and labor market information resource person, human resource career development coordinator, employment/placement specialist, workforce development staff person, or school career center technician. The three courses required to complete the certificate are each offered once a year online - two courses during fall semester and one course during spring semester. For Sylvia Hamilton, May 18, 2018, offered a moment she’d pursued for 56 years. At 83 years old, the Nevada City resident is one of the oldest graduates to be awarded a degree in the University’s 130-year history. Read more of her inspiring story in "Chico State Today."